Explains how adaptogenic herbs work at the cellular level to enhance energy production and subdue the pro-inflammatory state behind degenerative disease. Explores the author’s custom adaptogenic blends for the immune system, cardiovascular health, thyroid function, brain health, and cancer treatment support. Weaving together the ancient wisdom of herbalism and the most up-to-date scientific research on cancer, aging, and nutrition, renowned herbalist and clinical nutritionist Donald Yance reveals how to master stress, improve energy levels, prevent degenerative disease, and age gracefully with the elite herbs known as adaptogens. Yance’s holistic approach, called the Eclectic Triphasic Medical System (ETMS), is based on extensive scientific research, more than 25 years of clinical practice, and excellent results with thousands of patients. It centers on four interconnected groups of health tools: botanical formulations, nutritional supplements, diet, and lifestyle. Defining four categories for adaptogenic herbs, he explains how formulations should combine herbs from each category to create a synergistic effect. 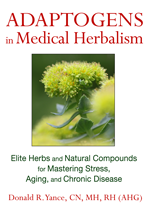 He provides more than 60 monographs on herbs and nutritional compounds as well as custom combinations to revitalize the immune system, build cardiovascular health, protect brain function, manage weight, and support cancer treatment. He explains the interplay of endocrine health, the hypothalamic-pituitary-adrenal (HPA) axis, thyroid function, and stress in the aging process and reveals how adaptogenic treatment begins at the cellular level with the mitochondria—the microscopic energy producers present in every living cell. Emphasizing spirituality, exercise, and diet in addition to herbal treatments and nutritional supplements, Yance’s complete lifestyle program explores how to enhance energy production in the body and subdue the pro-inflammatory state that lays the groundwork for nearly every degenerative disease, taking you from merely surviving to thriving. Visit www.adaptogensbook.com for more information and advance praise from Dr. Oz and Martha Stewart. More and more people who have been diagnosed with cancer or related illnesses embrace alternative medicines, and seek out holistic practitioners who use vitamins, herbs, nutrition, homeopathy, and acupuncture to treat the disease. This long-awaited book by Donald Yance—one of the nation’s most respected herbalists—is a major contribution to the literature of natural healing and cancer. Donald Yance, C.N., M.H., is a certified nutritionist and clinical master herbalist who specializes in nutritional and herbal approaches to cancer, AIDS, heart disease, and other chronic health conditions. He has written for several nutritional/herbal journals and has been a contributing writer for a number of books on healing. 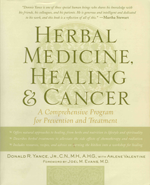 “Donald Yance, a Master Medical Herbalist and Clinical Nutritionist is one of the most knowledgeable and experienced experts on Collaborative and Integrative Cancer Care.This book is an invaluable resource for learning how to use foods, herbs and nutrients in the context of cancer prevention and cancer care. Donald Yance deeply understands the causes and the terrain of cancer. This book is a comprehensive introduction to understanding cancer and how to alter its course using natural medicines and nutrients. This book includes sections on Diet, Herbs,Supplements, Lifestyle Guidelines and the emotional and spiritual challenges of cancer.